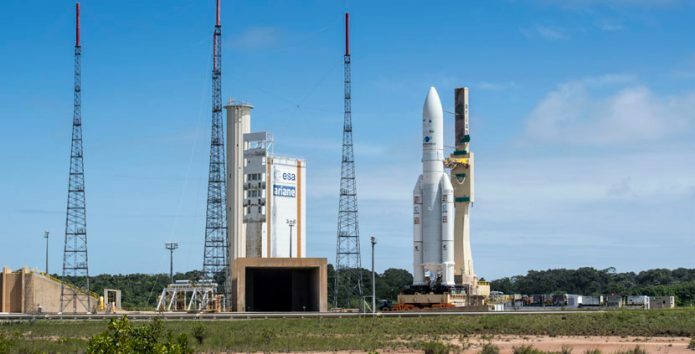 The Ariane 5 for Arianespace's Flight VA241 moves into position at the ELA-3 launch zone. 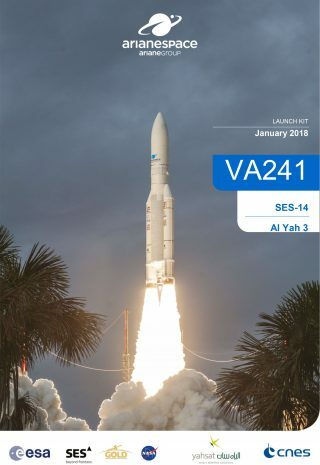 The Ariane 5 for Arianespace’s Flight VA241 has reached the launch zone in French Guiana, positioning this vehicle for tomorrow’s dual-payload mission with the SES-14 and Al Yah 3 telecommunications satellites. Riding atop a mobile launch table, Ariane 5 today completed its transfer from the Spaceport’s Final Assembly Building – where its two passengers were integrated – to the dedicated ELA-3 launch complex. This paves the way for tomorrow’s liftoff, which is planned during a 45-min. launch window that opens January 25 at 7:20 p.m. local time in French Guiana. Today’s rollout from the Spaceport’s Final Assembly Building marked one of the final milestones in preparations for Flight VA241, which will kick off Arianespace’s 2018 launch activity. The company is planning up to 14 missions this year using the heavy-lift Ariane 5, medium-lift Soyuz and lightweight Vega. Flight VA241 will be carrying a payload estimated at approximately 9,120 kg. This total factors in the two satellite passengers’ combined liftoff mass, as well as hardware for Ariane 5’s dual-payload deployment system. Riding in Ariane 5’s upper position, SES-14 is to be deployed first in the flight sequence, with its separation occurring 27 minutes after liftoff. The spacecraft – produced by Airbus Defence and Space for operator SES based on the E3000 EOR (Electric Orbit Raising) version of its Eurostar E3000 platform – will serve Latin America, the Caribbean, North America and the North Atlantic region with its C- and Ku-band wide beam coverage, as well as Ku-band high-throughput spot beams coverage. SES-14 also has a NASA-funded hosted payload for the Global-scale Observations of the Limb and Disk (GOLD) mission, which is to improve understanding of the thermosphere-ionosphere. Completing the mission will be the separation of Ariane 5’s lower passenger, Al Yah 3, which will occur 35 minutes after the flight begins. Built by Orbital ATK using its new GEOStar-3 hybrid platform, the satellite will be operated by Yahsat to provide affordable broadband communications to 60 percent of Africa’s population and more than 95 percent of Brazil’s population. The GEOStar-3 platform’s hybrid design uses traditional chemical propulsion to reach orbit in a matter of days, and then performs station-keeping operations for 15 years or more with electric propulsion, resulting in an optimum mass-efficient system.